The plan is to declutter your home in 15 minutes a day then you need to employ these 15-minutes cutter sweeps for every room in your home into your routine. This guide will take you through each room (or space) in your home with specific instructions on how to declutter that space in 15 minutes or less. Is your bathroom cluttered? Do you feel like you can’t find anything? This process should take between 15 and 20 minutes, depending upon the size of your bathroom and how long it's been since you've taken the time to declutter it. What: Quickly declutter your bathroom in 15-20 minutes. What you need: A timer, a trash bin, hamper, a recycling bin and a catch-all bin. Place your hamper in the doorway and step into the bathroom. It’s time to declutter! Toss any dirty hand towels, face cloths and bath towels into your hamper. Replace dirty towels with fresh ones from the linen closet. Move any laundry from the floor into the hamper. Trash or recycle items like used tissues, empty toiletry bottles, empty paper towels rolls, etc. Fill your catch-all bin or bag with anything that belongs in another room. Look especially for things that don't belong in the bathroom, like clothing, shoes and jewelry. Sweep the sink/counter top and replace items that are out of place. If your jewelry keeps finding it's way into the bathroom, maybe try storing your everyday jewelry in the bathroom. Next do the same in your drawers and under the sink. Re-store any items that found their way into the wrong spot. If an item keeps popping up in the wrong spot, consider moving it to a new home. Example: A makeup brush that keeps making its way out of the drawer its supposed to "live" in might be better off in a jar by your sink. Take the hamper and bring laundry to laundry room. The fastest way to declutter your bedroom is to ignorie your clothes closet. We’ll tackle the closet in a separate 15 minute installment. For now, let’s focus on tidying up your sleeping space and surrounding areas. You will dress, sleep and wake up more peacefully when you're not surrounded by clutter. Trust me. What you need: A timer, a trash bin, a recycling bin, hamper and a catch-all bin. Place your trash and recycling bins in the doorway. Start at your night tables and toss anything that needs to be trashed or recycled into their proper bins. Grab your catch-all bin and walk around your room tossing in any items that are out of place. Start by your bed and move outward from there. Common culprits here are work papers, mail, books and coats. Return extra linens to the linen closet or if dirty, put them in the hamper. Rearrange items on your night tables and tidy the surfaces. Go through the nightstand drawers doing a quick clutter sweep: toss, recycle, catch-all. Next head over to your bureaus and dressers and do the same. Sweep the top of each dresser or bureau for clutter. Cooking, meal planning and eating will be much less stressful when your kitchen is clutter-free. Walk around with a small bin and put everything that belongs outside of your kitchen into the bin. TIP: Most of the items that wandered out of their storage spaces probably ended up on your counter top. Do a sweep of your counter tops, the kitchen table, and the island and put everything back into place. TIP: Is there an item that keeps ending up in the wrong spot? Try finding a more convenient storage space of for it. For example, I love to corral cooking utensils in jars, and cookbooks on lone shelf next to the oven. Put any appliances back into their proper storage spaces and neatly wrap their cords. TIP: If an appliance keeps ending up on your counter top, consider moving it permanently to an easier-to-reach spot in your kitchen cabinets or onto the counter top itself. Straighten each shelf in your refrigerator, purging old food and moving vegetables and fruits back into their proper bins. Make sure items are on the shelves by height to maximize storage space. Next, straighten the shelves in your kitchen cabinets and pantry by ensuring all of your jars and bottles are facing front and stacked neatly. Finally, grab that bin and return everything that belongs outside the kitchen back to it's home. I like to combine kitchen decluttering with meal planning and if you are so inclined, take inventory of your foodstuffs while you straighten and re-arrange. Two birds, one stone. Your mission: Declutter your living room in just 15 minutes. What you need: Garbage bin, catch-all, bin, recycling bin, and a timer. Grab a bin large enough to hold things like magazines and books and then walk around the room putting anything out of place in the bin. Keep an eye out for any items that don't belong in the living room. Next go through each area returning everything to it's proper storage place. Got kids? Toss their toys back into the bins, cubbies or chests you keep them in. In the entertainment center area, unwind and re-store any cords that have twisted out of place, re-stack DVDs, CDs, etc. Corral all of your remotes and return them to the tray or box you store them in. Having a designated area for remotes will make them less likely be go missing. Straighten and re-stack any books that need re-arranging. Recycle any catalogs or magazines that you have not touched in a month. Straighten piles. Consider using a tray to house these major sources of clutter. Fold any blankets lying around and return them to their home base -- whether that be draped over the back of a couch or in a basket. Finally, hit the coffee table returning everything on top to it's proper storage space. To finish, take that bin and return everything in it to the room it's supposed to be in. Next, shred the shred pile. Not sure what to shred? Check the What to Shred List. Dump the recyclables. Don’t have a recycling bin? Please join the rest of us in this century and establish a recycling bin. Bins are one of your best weapons of defense against clutter. Take the mail you need to action to your desk or designated mail center and action each item. For ideas, see How to Organize Mail. 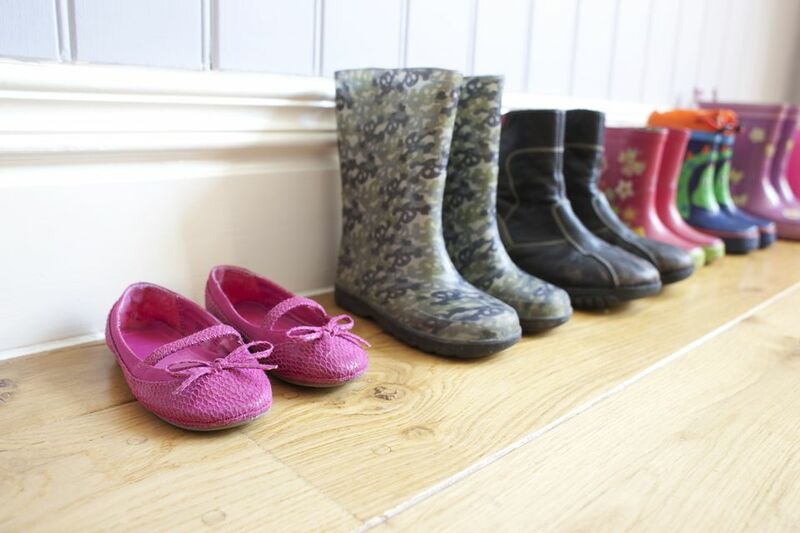 Your mission: Quickly declutter and tidy up your entryway in 15 minutes or less. What you need: Once again, grab the bin, box or bag you use to declutter and bring it into the entryway, foyer or hall closet area. Begin by hanging up any coats or jackets that belong hanging in the hall closet or on a coatrack that made their way onto the backs of chairs, on the entryway bench or into another room (check the kitchen--typically the second stop when entering the home). Check the pockets of these coats and jackets and any other that are worn regularly and declutter them by trashing old gum wrappers, recycling receipts, returning loose change to your wallet or change holder, and returning your keys to their storage space (See: 5 Quick Tips to Remember Your Keys). Repeat the process with book bags, hand bags and gym bags, placing anything that doesn't belong in them either in the trash, recycling bin, or in your clutter bin to be brought to another room. Example: Any dirty gym clothes go in the bin to be transported to the laundry room. And return them to their rightful storage spaces. Pick up any shoes or boots that were (wrongly) discarded in this spaces to be put back in their designated ares. Sweep and/or vacuum the area. Return bags, cell phones, and keys to their holders, and consider this a good time to also sort the mail. Your mission: Declutter those packed kitchen cabinets by purging the old, the un-used and the forgotten. What you'll need: Empty bin--something that is easy to move around with you, a trash bin or bag, a slightly damp rag, a dry rag or a handful of paper towels. 1. Start with top cabinets and open one at a time. 2. Remove trash and throw it in the trash bin. 3. Remove any out-of-place object from the cabinet and place it in the empty bin. 5. Wipe up any spills, then dry the area with your dry rag. 5. Repeat this process, working on each cabinet individually until each cabinet has been tidied and decluttered. 6. Carry your bin and replace each item in it back to it's proper storage space. You may be wondering why you're using a plastic bin to collect items instead of simply putting them on the countertop. Answer: You're much more likely to return items to their proper storage space--whether than be the pantry, another cabinet, or even another room--than if you leave things on your countertop. Your mission: Declutter your closet in just 15 minutes. What you need: A timer, a trash bin, a recycling bin and a catch-all bin or basket. Head to the closet and grab any empty hangers and put them aside in a pile or a place that will be easy to reach once you get going. Hang up or fold any clothing that strewn across the bedroom. Move any dirty into the hamper. Re-arrange hanging pieces until everything is hung together the way you like it. For instance, if you want to have everything color-coded keep going until all of your navy blues are lined up. Then start on the folded clothes in your closet like sweaters and long-sleeve shirts. There's no need to re-fold everything (unless it's a total disaster in there) just straighten the stacks. If you continually notice your neatly folded stacks of sweaters and moving out of place, consider some shelf dividers. I thought shelf dividers were useless until I actually started using them--they make stacks so much more organized and cut down on wrinkles because your sweaters aren't toppling over any more. Move to the floor. Line up shoes, storage boxes, luggage--whatever you have on the bottom of your closet. Make sure nothing has fallen that should be hanging or folded on a shelf. Next, spend 2-3 minutes picking out your clothes for the next 3 days. I promise, this will make your life infinitely easier! Hang the next day's outfit up on a valet hook. This process will save you about 30 minutes over the next 3 mornings while only taking your 5-10 right now, since you're already in your closet and have just touched and eyed the majority of your wardrobe.